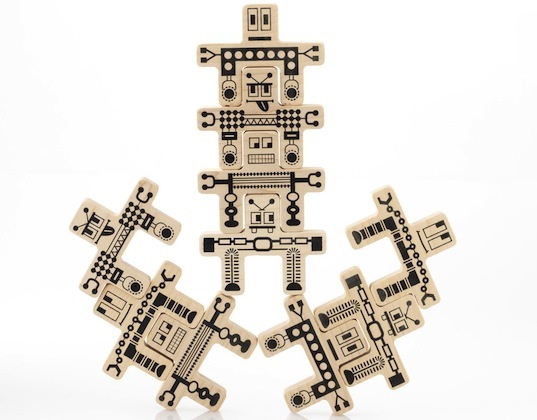 Whoa-Bots: The Cirque du Soleil of Building Block Sets! Tree Hopper Toys has created several Tots-approved toys with their philosophy that kids are active learners who just need simple tools to help them explore the world to the fullest. Their latest venture Whoa-Bots is the Cirque du Soleil of the building blocks set. Do you have one of those kids who is constantly surprising/terrifying you with her latest acrobatics and her ability to turn any piece of furniture into gymnastics equipment? 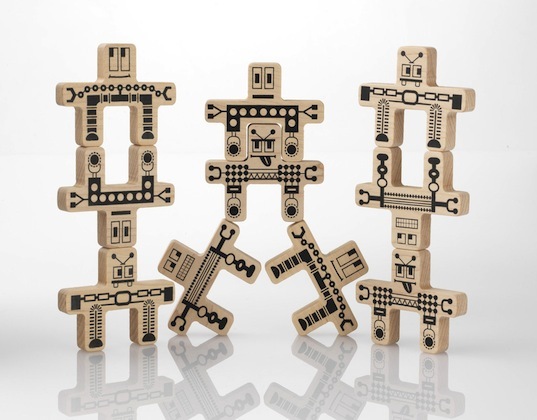 Whoa-Bots is unlikely to completely quell that natural energy, but this set of 8 robot-shaped blocks will allow her to explore balance and fine motor skills while keeping her own feet on the ground. Treehopper Toys prides itself on sustainable American lumber sources, non-toxic finishes, and an office, warehouse, and shop totally fueled by wind power.